$1500 deposit. 47 monthly repayments of $556. 60,000 KM allowance and a final payment of $18006 to keep your Toyota. 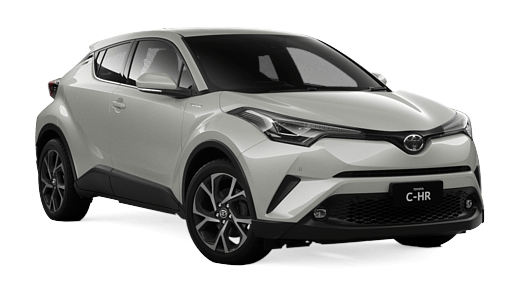 Why buy from Tamworth City Toyota ? Toyota is Australia’s favourite brand of vehicle. Toyota's quality, durability, reliability and safety are legendary. To be the most reliable, dependable car brand in the world, you can't rest on your laurels. You must be constantly testing, refining and improving. When you buy from Tamworth City Toyota, you’re not just getting a new vehicle. You’re getting a team of people that will care for and protect you and your car now and into the future. At Tamworth City Toyota we take the time to understand your needs and recommend the vehicle that will meet your lifestyle or business requirements. At Tamworth City Toyota, we understand that purchasing a vehicle is a big decision. We're determined to make this process simple and enjoyable by offering competitive prices and outstanding customer service. Competitive business and personal Finance & Insurance options. Toyota Access Finance with Guaranteed Future Value of your Toyota. Toyota Genuine Accessories and Parts. Wide range of vehicles in stock. Have a chat to the Tamworth City Toyota Team, we're recognised for our outstanding leadership and high achievement in all aspects of dealer performance. Conveniently located at 311 – 315 Marius St, Tamworth NSW 2340. We look forward to welcoming you soon. $1500 deposit. 47 monthly repayments of $567. 60,000 KM allowance and a final payment of $18006 to keep your Toyota. $1500 deposit. 47 monthly repayments of $566. 60,000 KM allowance and a final payment of $19432 to keep your Toyota. This C-HR is available for Test Drive Today! [^A]Comparison Rates will vary for each customer between 6.64% and up to 16.76% (and annual percentage rates between 4.32% to 14.25%) depending primarily on your credit score and other relevant criteria determined by Toyota Finance. Comparison rates of 9.17% are available to around 70% of potential customers with a credit score of 600 and above, who also satisfy other relevant criteria determined by Toyota Finance. These figures are based on modelling by Toyota Finance. 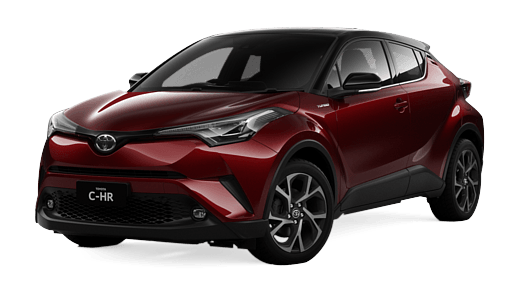 [†A] $129 per week are available on a Toyota Access Consumer Loan to approved personal applicants of Toyota Finance to finance the purchase of a Toyota C-HR Koba 2WD Automatic CVT (Ink and Black Leather Accented) Automatic, 1.2L Petrol . Driveaway price of $36490 (includes 12 months registration, 12 months compulsory third party insurance, dealer delivery and stamp duty), less a deposit of $1500, with 47 monthly payments in arrears not exceeding $556 and a balloon final payment (equal to the ‘GFV’) of $18006. Additional interest charges accrue whenever a balloon final payment option is selected. Based on an annual percentage rate of 6.81 %. Total amount payable $44138. Terms, conditions, fees and charges apply. Offer valid until 20/04/2019. Comparison Rate of 9.17% is based on a 5 year secured consumer fixed rate loan of $30,000. WARNING: This comparison rate is true only for the examples given and may not include all fees and charges. Different terms, fees or other loan amounts might result in a different comparison rate. Toyota Finance is a division of Toyota Finance Australia Limited ABN 48 002 435 181, AFSL and Australian Credit Licence 392536. The Guaranteed Future Value ('GFV') is the minimum value of your new or approved demonstrator Toyota at the end of your finance contract, as determined by Toyota Finance, subject to fair wear and tear conditions and agreed kilometres being met (up to 60000 km). Please speak with your dealer for more information. [^B]Comparison Rates will vary for each customer between 6.64% and up to 16.76% (and annual percentage rates between 4.32% to 14.25%) depending primarily on your credit score and other relevant criteria determined by Toyota Finance. Comparison rates of 9.17% are available to around 70% of potential customers with a credit score of 600 and above, who also satisfy other relevant criteria determined by Toyota Finance. These figures are based on modelling by Toyota Finance. 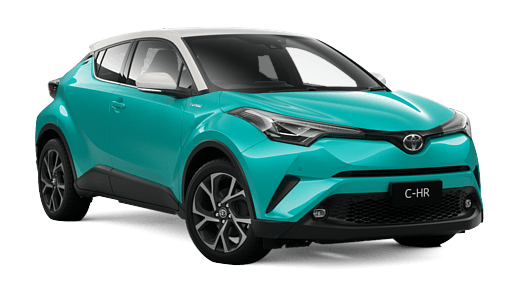 [†B] $131 per week are available on a Toyota Access Consumer Loan to approved personal applicants of Toyota Finance to finance the purchase of a Toyota C-HR Koba AWD Automatic CVT (Electric Teal/White Two Tone and Black Leather Accented) Automatic, 1.2L Petrol . Driveaway price of $37990 (includes 12 months registration, 12 months compulsory third party insurance, dealer delivery and stamp duty), less a deposit of $1500, with 47 monthly payments in arrears not exceeding $566 and a balloon final payment (equal to the ‘GFV’) of $19432. Additional interest charges accrue whenever a balloon final payment option is selected. Based on an annual percentage rate of 6.81 %. Total amount payable $46035. Terms, conditions, fees and charges apply. Offer valid until 20/04/2019. Comparison Rate of 9.17% is based on a 5 year secured consumer fixed rate loan of $30,000. WARNING: This comparison rate is true only for the examples given and may not include all fees and charges. Different terms, fees or other loan amounts might result in a different comparison rate. Toyota Finance is a division of Toyota Finance Australia Limited ABN 48 002 435 181, AFSL and Australian Credit Licence 392536. The Guaranteed Future Value ('GFV') is the minimum value of your new or approved demonstrator Toyota at the end of your finance contract, as determined by Toyota Finance, subject to fair wear and tear conditions and agreed kilometres being met (up to 60000 km). Please speak with your dealer for more information. [^C]Comparison Rates will vary for each customer between 6.64% and up to 16.76% (and annual percentage rates between 4.32% to 14.25%) depending primarily on your credit score and other relevant criteria determined by Toyota Finance. Comparison rates of 9.17% are available to around 70% of potential customers with a credit score of 600 and above, who also satisfy other relevant criteria determined by Toyota Finance. These figures are based on modelling by Toyota Finance. 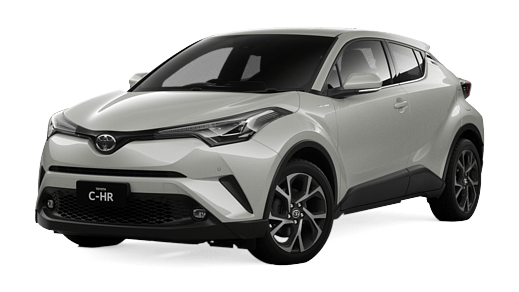 [†C] $129 per week are available on a Toyota Access Consumer Loan to approved personal applicants of Toyota Finance to finance the purchase of a Toyota C-HR Koba 2WD Automatic CVT (Crystal Pearl and Black Leather Accented) Automatic, 1.2L Petrol . Driveaway price of $36490 (includes 12 months registration, 12 months compulsory third party insurance, dealer delivery and stamp duty), less a deposit of $1500, with 47 monthly payments in arrears not exceeding $556 and a balloon final payment (equal to the ‘GFV’) of $18006. Additional interest charges accrue whenever a balloon final payment option is selected. Based on an annual percentage rate of 6.81 %. Total amount payable $44138. Terms, conditions, fees and charges apply. Offer valid until 20/04/2019. Comparison Rate of 9.17% is based on a 5 year secured consumer fixed rate loan of $30,000. WARNING: This comparison rate is true only for the examples given and may not include all fees and charges. Different terms, fees or other loan amounts might result in a different comparison rate. Toyota Finance is a division of Toyota Finance Australia Limited ABN 48 002 435 181, AFSL and Australian Credit Licence 392536. The Guaranteed Future Value ('GFV') is the minimum value of your new or approved demonstrator Toyota at the end of your finance contract, as determined by Toyota Finance, subject to fair wear and tear conditions and agreed kilometres being met (up to 60000 km). Please speak with your dealer for more information. [^D]Comparison Rates will vary for each customer between 6.64% and up to 16.76% (and annual percentage rates between 4.32% to 14.25%) depending primarily on your credit score and other relevant criteria determined by Toyota Finance. Comparison rates of 9.17% are available to around 70% of potential customers with a credit score of 600 and above, who also satisfy other relevant criteria determined by Toyota Finance. These figures are based on modelling by Toyota Finance. 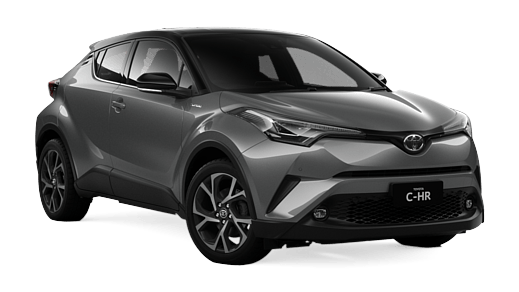 [†D] $131 per week are available on a Toyota Access Consumer Loan to approved personal applicants of Toyota Finance to finance the purchase of a Toyota C-HR Koba AWD Automatic CVT (Shadow Platinum and Black Leather Accented) Automatic, 1.2L Petrol . Driveaway price of $37990 (includes 12 months registration, 12 months compulsory third party insurance, dealer delivery and stamp duty), less a deposit of $1500, with 47 monthly payments in arrears not exceeding $566 and a balloon final payment (equal to the ‘GFV’) of $19432. Additional interest charges accrue whenever a balloon final payment option is selected. Based on an annual percentage rate of 6.81 %. Total amount payable $46035. Terms, conditions, fees and charges apply. Offer valid until 20/04/2019. Comparison Rate of 9.17% is based on a 5 year secured consumer fixed rate loan of $30,000. WARNING: This comparison rate is true only for the examples given and may not include all fees and charges. Different terms, fees or other loan amounts might result in a different comparison rate. Toyota Finance is a division of Toyota Finance Australia Limited ABN 48 002 435 181, AFSL and Australian Credit Licence 392536. The Guaranteed Future Value ('GFV') is the minimum value of your new or approved demonstrator Toyota at the end of your finance contract, as determined by Toyota Finance, subject to fair wear and tear conditions and agreed kilometres being met (up to 60000 km). Please speak with your dealer for more information. [^E]Comparison Rates will vary for each customer between 6.64% and up to 16.76% (and annual percentage rates between 4.32% to 14.25%) depending primarily on your credit score and other relevant criteria determined by Toyota Finance. Comparison rates of 9.17% are available to around 70% of potential customers with a credit score of 600 and above, who also satisfy other relevant criteria determined by Toyota Finance. These figures are based on modelling by Toyota Finance. 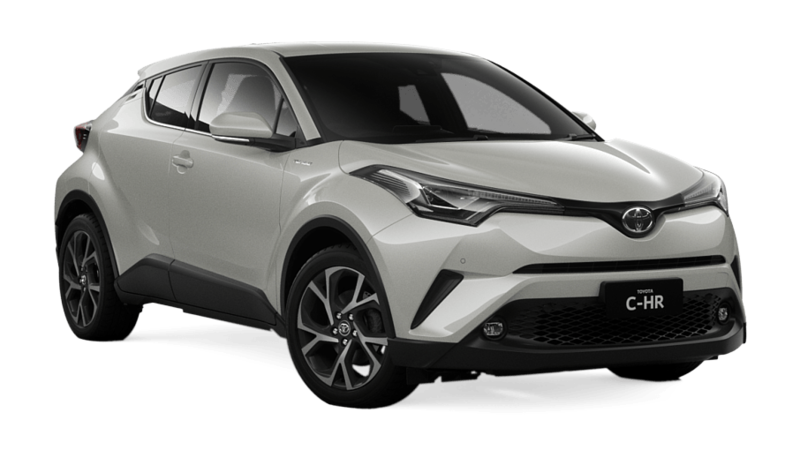 [†E] $131 per week are available on a Toyota Access Consumer Loan to approved personal applicants of Toyota Finance to finance the purchase of a Toyota C-HR Koba AWD Automatic CVT (Crystal Pearl and Black Leather Accented) Automatic, 1.2L Petrol . Driveaway price of $37990 (includes 12 months registration, 12 months compulsory third party insurance, dealer delivery and stamp duty), less a deposit of $1500, with 47 monthly payments in arrears not exceeding $566 and a balloon final payment (equal to the ‘GFV’) of $19432. Additional interest charges accrue whenever a balloon final payment option is selected. Based on an annual percentage rate of 6.81 %. Total amount payable $46035. Terms, conditions, fees and charges apply. Offer valid until 20/04/2019. Comparison Rate of 9.17% is based on a 5 year secured consumer fixed rate loan of $30,000. WARNING: This comparison rate is true only for the examples given and may not include all fees and charges. Different terms, fees or other loan amounts might result in a different comparison rate. Toyota Finance is a division of Toyota Finance Australia Limited ABN 48 002 435 181, AFSL and Australian Credit Licence 392536. The Guaranteed Future Value ('GFV') is the minimum value of your new or approved demonstrator Toyota at the end of your finance contract, as determined by Toyota Finance, subject to fair wear and tear conditions and agreed kilometres being met (up to 60000 km). Please speak with your dealer for more information. [^F]Comparison Rates will vary for each customer between 6.64% and up to 16.76% (and annual percentage rates between 4.32% to 14.25%) depending primarily on your credit score and other relevant criteria determined by Toyota Finance. Comparison rates of 9.17% are available to around 70% of potential customers with a credit score of 600 and above, who also satisfy other relevant criteria determined by Toyota Finance. These figures are based on modelling by Toyota Finance. 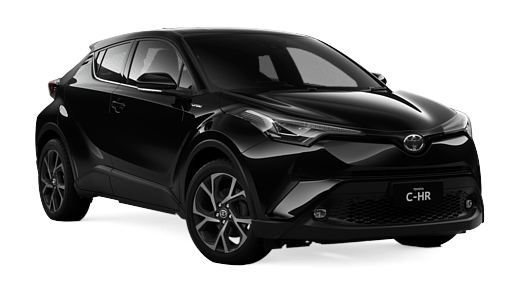 [†F] $131 per week are available on a Toyota Access Consumer Loan to approved personal applicants of Toyota Finance to finance the purchase of a Toyota C-HR Koba 2WD Automatic CVT (Shadow Platinum with Black Roof and Black Leather Accented) Automatic, 1.2L Petrol . Driveaway price of $36940 (includes 12 months registration, 12 months compulsory third party insurance, dealer delivery and stamp duty), less a deposit of $1500, with 47 monthly payments in arrears not exceeding $567 and a balloon final payment (equal to the ‘GFV’) of $18006. Additional interest charges accrue whenever a balloon final payment option is selected. Based on an annual percentage rate of 6.81 %. Total amount payable $44655. Terms, conditions, fees and charges apply. Offer valid until 20/04/2019. Comparison Rate of 9.17% is based on a 5 year secured consumer fixed rate loan of $30,000. WARNING: This comparison rate is true only for the examples given and may not include all fees and charges. Different terms, fees or other loan amounts might result in a different comparison rate. Toyota Finance is a division of Toyota Finance Australia Limited ABN 48 002 435 181, AFSL and Australian Credit Licence 392536. The Guaranteed Future Value ('GFV') is the minimum value of your new or approved demonstrator Toyota at the end of your finance contract, as determined by Toyota Finance, subject to fair wear and tear conditions and agreed kilometres being met (up to 60000 km). Please speak with your dealer for more information. [D2] Recommended driveaway price (RDP) shown is applicable for Private customers, Bronze, and Silver Fleet customers, and primary producers, only at participating dealers. Offer available on new January 2019 to April 2019 built models purchased between 01/03/2019 and 30/04/2019 unless extended. RDP includes 12 months registration, 12 months compulsory third party insurance (CTP), a maximum dealer delivery charge, stamp duty and metallic/premium paint. Toyota reserves the right to amend the offer and terms at any stage.